A Seattle-based Internet marketing agency, Portent, has released a report that gives us an interesting insight on Google’s Penguin update. 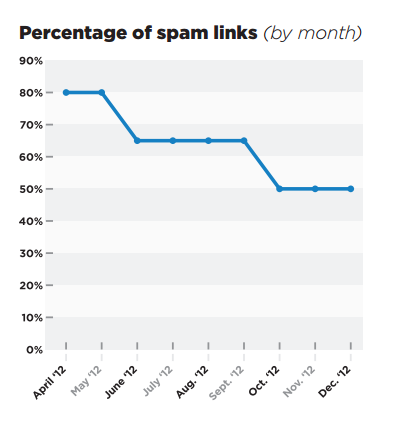 It indicates that Google is becoming increasingly stricter when it comes to manipulative links. In the initial Penguin update, the only sites we saw penalized had link profiles comprised of more than 80 percent manipulative links. Within two months, Google lowered the bar to 65 percent. Then in October 2012, the net got much wider. Google began automatically and manually penalizing sites with 50 percent manipulative links. What it means is that Google is targeting the worst offenders first and making its way down. So don’t be too happy if you haven’t been hit by the dreaded Penguin yet. Now it’s time to have a good look at your link profile and do some cleaning up (or disavowing).